20.1 How Do I Choose The Light Or Dark Path? 20.2 If I'm in light mode, how come I can use dark skills? Welcome to my comprehensive guide for Luminous. This guide has everything a Luminous need to know varying from skill builds to AP distribution to training spots to equipment to medals! We have everything you need to know! Hyper Skills are included! I am currently adding medals, quest guide, training locations, etc. Luminous Guide is the second Magician Hero and the final addition in Legendary Hero class introduced in the second part of the Tempest Update. Luminous was previously known as a Mage of Light before he was corrupted by the Black Mage, transferring his evil powers into him. As of the other heroes besides Freud, he was frozen by the Black Mage. The story starts off at the Temple of Time with Luminous making his way towards the Black Mage's chamber. Luminous meets up with Phantom, who calls him out on his tardiness and leaves. Afterwards, you meet Guwaru, one of the commanders of the Black Wings, who tries to destroy you. Before he could, he is killed by Magnus, another commander. Luminous attacks Magnus, all work to no avail. Magnus tells him that he is done with Maple World and leaves. We see Luminous lying unconscious on Ellinia. He is awakened by a little girl named Lania, who befriends him and spends time with him for years to come. Time passes and Lania has developed into a mature woman. One day, Lania askes Luminous to do some errands and believes the day is nice for a picnic. Luminous agrees to the notion, but before he can say goodbye, dark energy envelops Luminous and culminates into a large-scale explosion, that destroys the environment around and severly harms Lania. ALl of a sudden, he remembers what the Black Mage has told him and realizes that some of his powers was given to Luminous. 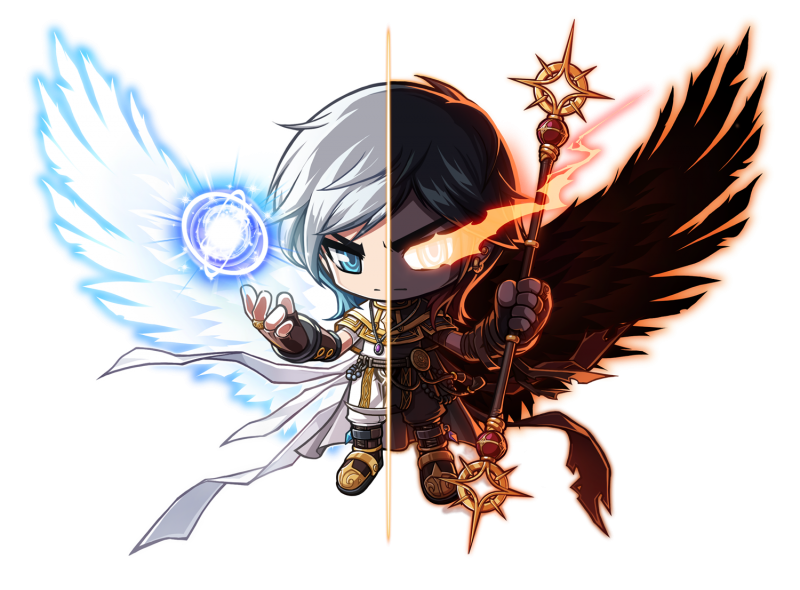 In Korean Maplestory, your player will have to choose between the path of light and dark. If you choose the light side, Luminous will restore everything he has destroyed and bring Lania back to health. If you choose the dark side, Luminous will leave the area and Lania in order to discover his newfound dark powers. In Global Maplestory, Luminous' story focuses mostly on the dark side. Luminous can be considered to be one of the more unique classes in Maplestory. Asides from gameplay, Luminous is the first class that incorporates actual voice acting within gameplay. 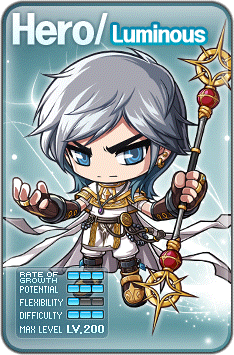 In Korean Maplestory, his storyline is also interactive, changing depending on which side that you take: Light or Dark. Choosing one of the sides will have an impact on his quests and his skills as well. However, in Maplestory Global, his story is melded together in one questline. Also, Luminous can have bonuses for both Light and Dark skills. Upon second job, his gameplay takes a new twist. You are greeted with a gauge that measures the amount of light and dark is present. You will enter into a Light or Dark mode in which your skills respective to their side will be significantly stronger. The only way to get out of Light or Dark mode is to use the skills that responds to your current mode; If you are in Light mode, you use a Light skill and in Dark mode, you use a Dark skill. Apart from the damage increase, you will also enter into a special buff that will be a great asset to the player. Lastly, if you use a certain skill in its respective mode, the amount of hits the skill make is doubled, providing more power. Up to 3rd job, you will have the ability to balance your Light and Dark gauge into a state of Equlibrium, which will greatly increase both Light/Dark skills and Equilibrium skills itself. In Global Maplestory, you can change which mode you are in with a skill and how much the gauge fills up does not alter any changes towards Luminous' modes in any way. Luminous' weapon of choice are double edged magical weapons known as Shining Rods and his secondary weapon are Orbs. Higher level orbs can be bought and sold at various NPC markets. Highest Mana Pool of any Magician. Offers a unique variety of gameplay with the Light/Dark system. Slower attacking speed compared to Evan. When the Tempest patch was released, all secondary stats were rendered useless. Now just pump all your points into INT. Luminous has an entirely new attacking system which makes them unique from other classes. A crystal gauge appears when you are second job. It has light crystals on the left and dark crystals on the right. There is a light/dark image directly below the question mark of the crystal. If you want to enhance your light skills, you click on the light side and your light skills will receive an increase. The increase is from the beginner skill called Sunfire. Light skills receive 50% more damage, cost 50% less MP and recovers 1% hp from each attack. If you click on the right side, you'll be under the influence of Eclipse. Dark skills deal 50% more damage, cost 50% less MP and recovers 1% hp from each attack. Luminous has an entirely new weapon which will be introduced into GMS upon its release. It is called a shining rod. A shining rod is a one handed mage weapon. Luminous also has a projectile they need or they cannot attack. This is similar to Mercedes's arrow and Phantom's card. Luminous' projectile is an orb. You already have one sp for Abyssal Drop and Flash Shower when you advance at level 10. We get Sylvan Lance and Pressure Void automatically at level 30. Summary: All maxed except Blinding Pillar. Explanation: At level 30, you have two new attacks automatically with 3 SP. We put the next 5 points into magic booster to make our attack speed faster. Faster attack = more damage = dead monsters = more exp = happy you. Spell mastery is maxed to increase our magic mastery and give us more damage. High Wisdom is maxed next to give us more int. More int = more damage. Black Blessing is maxed for a significant damage boost. Max which ever attacking skill you feel comfortable with (NOT BLINDING PILLAR). I like Sylvan Lance for some reason. Then we max Magic Booster to extend the booster time. Lastly, dump your points into the useless skill Blinding Pillar. All it does is push monsters away which makes it more time consuming to attack them all. Ray of Redemption hits 3 times and heals 800% at max level (the game description doesn't mention the extra hits). Because Moonlight Spear isn't needed in 4th job, you can avoid using dark mode entirely in 3rd, and MS is pitifully weak compared to Spectral Light, you may want to consider telling people reading your guide that maxing Ray of Redemption instead is viable because it retains a secondary purpose in 4th job. Summary: All skills are maxed. You add one point into Apocalypse, Reflection, Ender and Morning Star for brand new attacks! Reflection replaces Spectral Light at level 11. You max magic mastery for another monstrous damage increase. Followed by magic mastery is darkness mastery which also increases the damage of death scythe and gives you more power in equilibrium mode. Arcane pitch is then maxed for some extra PDR and critical. The next part is your choice. What do you prefer, Apocalypse or Reflection? Then you max Dark Crescendo for damage stack, followed by Ender. Ender can 1 hit KO monsters and Dark Crescendo stacks damage. Now you max the attack that you didn't choose to max before. It's either Apocalypse or Reflection. Maple Warrior and Hero's Will follow. Morning Star is maxed last as it is the least effective skill. Passive Stat Boost (S): Passive skills that will add bonus stats to your character. Passive Skill Boost (P): Passive skills that will upgrade your character's normal skills, it's effects varies from increased damage to another attack count to more unique abilities. Active Attack/Buff (A): Along with your passive skills, you will gain one attacking skill and two buffs. You are able to recieve your first buff at level 150, your attack at level 170 and your second buff at level 200. This makes a total of 6 (S) SP, (5) P SP, and (3) A SP. You can reset your SP in order to use it for other skills, but it requires a certain meso cost, which gradually increases the more you reset, starting at 100,000 mesos and going up to 10 million mesos. Level 140: We add one point into Hyper Intelligence (Passive Stat Enhancer) for a +50 INT boost . You save your Passive Skill Enhancer point until you find a very useful skill. Level 150 We use your saved SP point, Active Buff/Attack SP (the A-Type) and put it on Equalize so that you can instantly go to Equilibrium. Leave your Passive Stat Enhancer SP for Hyper Physical Guard for the extra Defense. Level 165 add the point saved for the Passive Stat Enhancer SP into Hyper Physical Guard. At 168, use your Passive Skill Enhancer SP in Apocalypse - Recharge so that you can get to Equilibrium more quickly. Level 170: At Level 170, you put the Saved Passive SKill Enhancer SP from Level 150 into Armageddon for a nice Ultimate. Then, at level 174, add the Passive Stat Enhancer SP into Hyper Magical Guard for the extra Magic Defense! Level 180: At Level 180, save the Passive Skill Enhancer SP. Once you hit Level 186, use the saved Passive Stat Enhancer SP from Level 170 and add it to Hyper Max Mana Point for (Even more Mana onto your already extremely high mana) MP. Then, at Level 189, use the saved Passive Skill Enhancer SP from Level 180 and add it to Apocalypse - Extra Target so you can hit more monsters. Level 190: Save the Passive Stat Enhancer SP. Add the Passive Skill Enhancer SP into Reflection - Add Range so you can stay farther away from the monsters when you attack. At Level 198, use the saved Passive Stat Enhancer SP for higher Critical Rate. Level 200: Add the Passive Stat Enhancer SP to Hyper Max Health point so that Magic Guard can be a little less overused. Add the Passive Skill Enhancer SP to Ender- Extra Target so that when you're bossing, you can hit more boss noobs like at Cygnus. Then, add the Active Attack Or Buff SP into Heroic Memories to increase damage cap. How Do I Choose The Light Or Dark Path? In GMS, you do not choose a path. You control both powers. If I'm in light mode, how come I can use dark skills? Luminous is designed so that you can utilize both skills. If you are in light mode and you use light skills, you gain a damage increase. You can still use dark skills, but you will not gain an advantage. This page was last edited on 12 February 2013, at 02:30.